This year has been a roller coaster ride for us as we have collaborated with several amazing properties all over India. The year was filled with volunteering plans, elaborate travel plans, and a few exciting International trips as well. However, I have to say that our best stay till date has to be at The Pahadi Organic in the Kumaon region, nestled amidst the mountains with Jim Corbett only a few km away. Yes, we are talking about our recent stay at The Pahadi Organic which has truly made us crave this luxurious lifestyle and has motivated us to work harder to achieve it. Full Disclosure: In collaboration with Stay On Skill, we were asked to stay at this property in Uttarakhand in return for an honest review of the place. And the truth is that we are in love with this place. 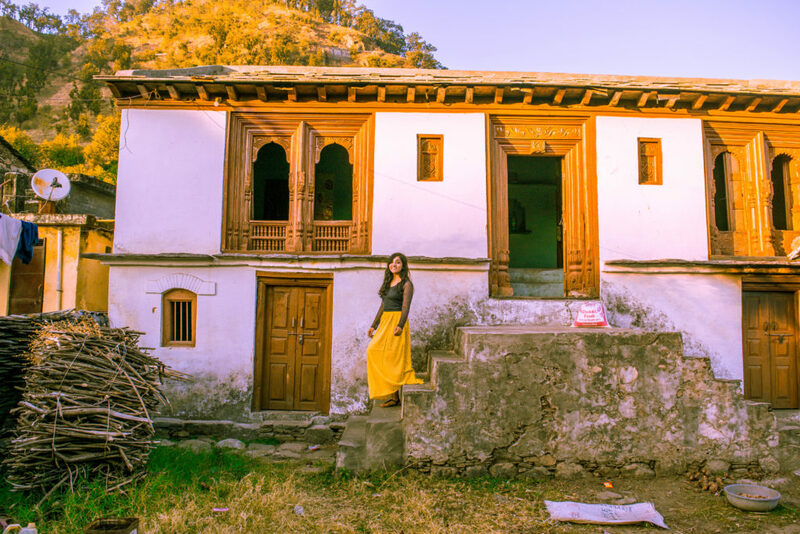 Sure, it is on the luxurious side but with its authentic and organic Kumaon food, offbeat tourist spots, and a plethora of activities, The Pahadi Organic is how you can experience the true pahadi life. If you are interested to know more about what made us fall in love with this hotel, then scroll down to continue reading. What Makes The Pahadi Organic Unique? Started as a gesture to spread the joy of eating Kumaon local dishes made up of organic vegetables, The Pahadi Organic has now become a symbol of Kumaon experience. The owners, Ranjeet Rawat and his son, Chetan Rawat, started this effort last year by opening The Pahadi Restaurant where they serve an assortment of Kumaon dishes like Dubke, Lapasi, Palak ka Kappa, and so on. But that wasn’t enough, they wanted to further share the Kumaon culture and region with the tourists and started the Pahadi Organic motel in January 2018. Now, The Pahadi Organic has become synonymous with an authentic Kumaon experience is one of the best hotels in the Totam region. From activities to views, this property has it all which makes it a good choice for anyone who is looking for an Offbeat weekend trip to a hill station. Built out of wood and stones, you can notice the intricate design and wood carving which further add to your Kumaon culture experience. And the cherry on the cake is that since it is just 30-35 km away from the Corbett National Park, you can easily go for a safari to catch a glimpse of the animals here. Further, if you want to have another safari experience, check out the blog on Tiger Safari in Nagarhole National Park. The Pahadi Organic aims to offer you a fun and energizing vacation where you can relax and take in the views around you. And with the amazing sunrise and sunset points, you can admire the nature and get views like no other. Best part? There aren’t many tourists or travelers who know about these locations so you don’t have to worry about these offbeat destinations being crowded as well. 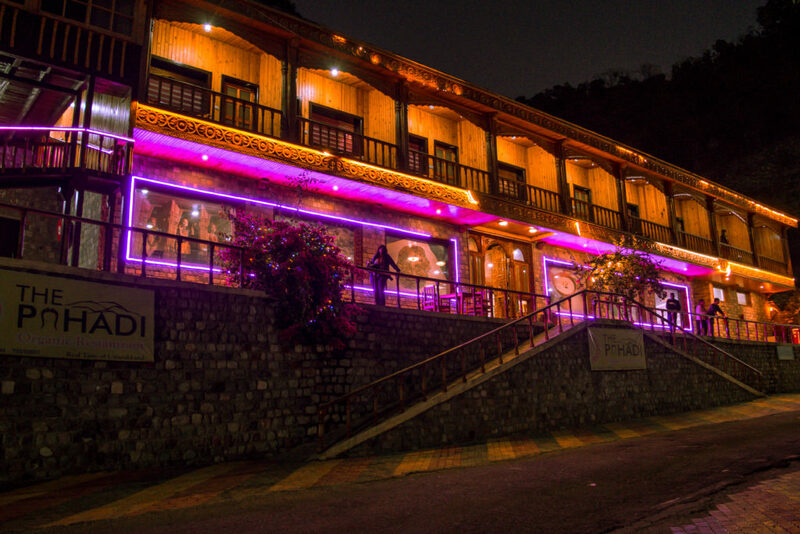 The Pahadi Organic hotel and restaurant is located in the Gate section, near the Totam village in Uttarakhand. It is situated at a distance of 40 km from the Ramnagar village and is surrounded by the Himalayan foothills so you enjoy a nice and pleasant climate throughout the year. The property is located roadside so you have plenty of buses and shared taxis going on this route which makes it easy to reach via public transport. And it is around 30-35 km away from Corbett National Park and 40-45 km from Ranikhet. So, you can have day trips to explore other places as well while enjoying a comfortable stay here. The Pahadi Organic is directly accessible from the road, so you have several options to reach this place. If you have your own car or a driving license then you can rent a car and drive up to this place. It is situated around 357 km from Delhi and would take about 6-7 hours to reach. The roads are in good condition for the most part so if you have experience in driving on hills then you can definitely go for a road trip to this place. If you can’t drive, don’t worry. You always have private and state buses going towards Ramnagar which you can book for yourself. An ordinary state bus will cost you 290 INR from Delhi to Ramnagar and will take around 8-9 hours to reach. There are a few private Volvos also for this route which you can opt for if you want a comfortable journey. You also have two trains from Delhi to Ramnagar which take around 6-7 hours and cost around 170-250 INR if you choose Sleeper or Second Sitting. And once you reach, Ramnagar, you will get a local bus going to the Totam village which will cost about 50 INR, taking 45-50 minutes, and will drop you right outside the Pahadi hotel. Although this is a year-round destination, if you want to plan a visit to the Corbett too then the best time to visit would be winter months, I.e., November to March. 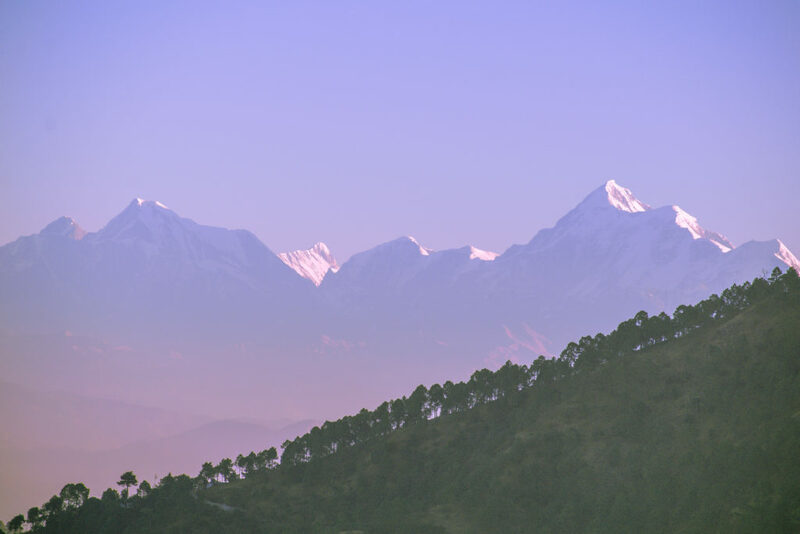 At this time, it would be slightly cold here but you would get absolutely clear views of the Himalayan mountains. In fact, you would also find it easy to spot some peaks like Trishul, Panch Sheel, Gaumukh, and so on. However, come with warm clothes and sweaters as it starts to get really cold here from the month of October – November. You can also visit the place in Summer or Spring season as the weather remains cooler than the plains. And you also have a greater chance at animal sightings in Corbett as the animals stay near to the water source to sate their thirst. For people who aren’t deterred by landslides and a little rainfall, the monsoon is the best time as the entire place becomes lush green and extremely gorgeous to look at. Personally, the monsoon is my favorite time to head to a hill station. 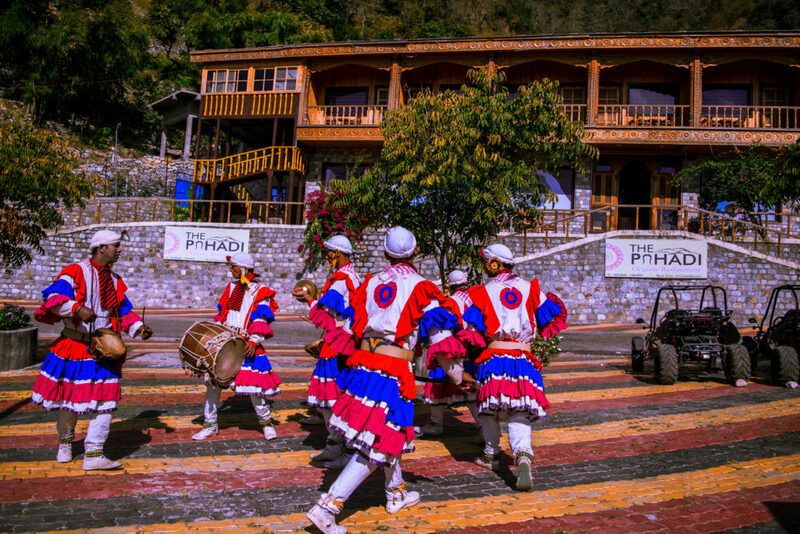 Honestly, The Pahadi Organic is one of the most unique hotels which we have stayed in till now. Here are a few things which set this place so special and amazing and made us really enjoy our stay here. When you arrive outside the hotel, the first thing that you would notice is a group of traditionally-dressed men in white churidar, tanka, and Chola. And they would have drums, shell horns, flutes, etc. in their hands which they would start playing while performing the traditional Kumaon ‘Sword Dance’, Chholiya. A dance which originated thousands of years ago, it is quite refreshing and is likely to be a different experience from any hotel that you have visited so far and will certainly put a smile on your face. Another great thing about The Pahadi Organic hotel is that this place is situated just 30 km away from the Jim Corbett National Park. So, if you would like to go on a safari, you can book your stay here and then enjoy morning or evening safari to sight some tigers. You can also ask the owner to book private safaris for you beforehand so that you don’t have to worry about the small details. One thing to note would be that Jeep safaris for Jim Corbett National Park get booked in advanced. So, if you really want to go and see the animals here, book a safari at least 10-15 days prior to your visit. At The Pahadi Organic, you will not only experience a comfortable and cozy stay but you also have access to a lot of local excursions. You can ask the owner to arrange hiking tours, village walks, adventure activities for you so that you can explore the area like locals. The owner at the Pahadi Organic often explore their surrounding places and come across a few gems which they share with their guests for a good guest experience. So, if you want to enjoy breakfast at a waterfall or go for a morning hike, you can just let them know and they will arrange the same for you. They also have an activity zone where you can do flying fox, walk the Burma bridge, ride an ATV, and do numerous other things. One of the things which impressed me the most about this hotel is the room design and decor. They have a total of 14 luxurious rooms here, made up of wood, which offers a really cozy feel to its guests. In the room, they have provided a comfortable double bed, a TV, a mini-fridge, a locker, cupboard, seating arrangement by the window, and a clean and sophisticated mid-sized bathroom for use. 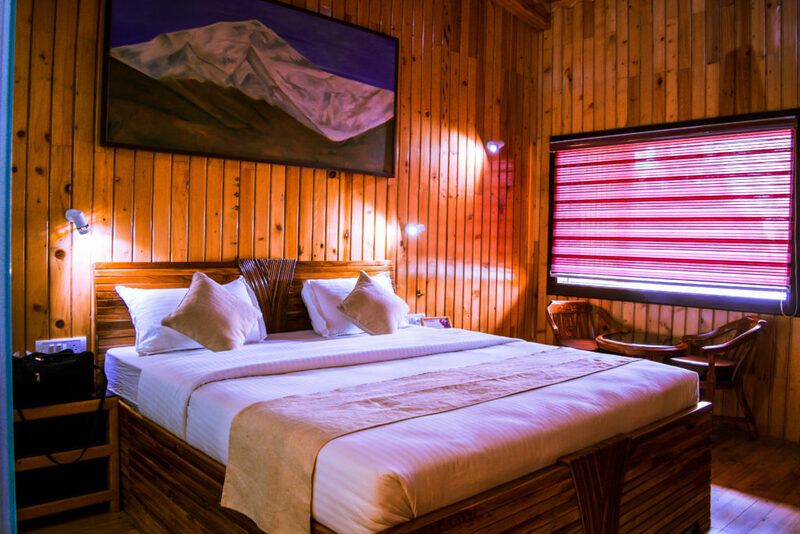 Also, you will find a beautiful painting hanging just above the bed which gives a little charm to this place and there is a small balcony attached which offers the mesmerizing views of the Himalayan foothills. You also have a common room connected to your bedroom which is again designed using wood and has a vintage-y feel about it. Apart from gorgeous rooms and common spaces, you also have a few services at your disposal which you won’t find at most other hotels. They have a massaging chair in the common room which you can use anytime to relax and release a little stress while you are here. Trust me, we made the most of this chair and spent at least an hour every day on it, relaxing our body and having the time of our lives. That’s not all though. They also provide you WiFi services along with 24*7 hot water supply and a locker to keep your precious belongings safe and secure. And the exercising equipment in the common room is a great way to burn some calories while you are here and is extremely easy to use as well. 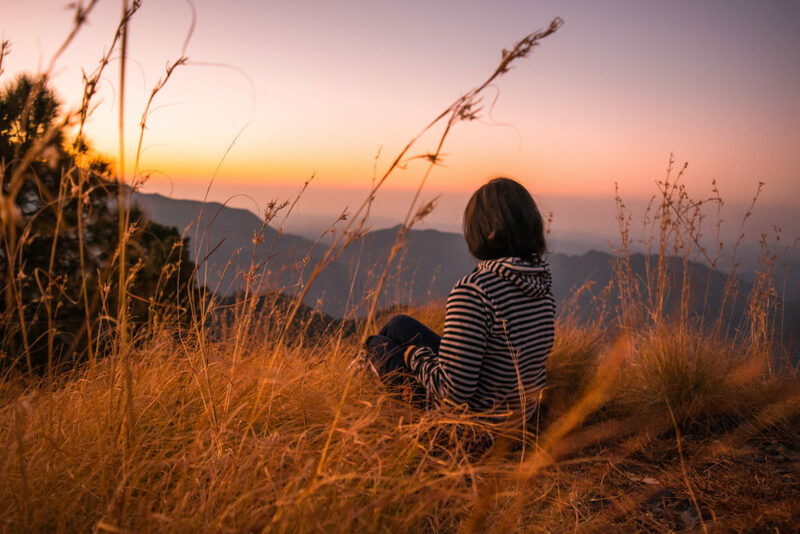 While they do arrange morning and evening hikes for you to enjoy the mountain views, The Pahadi Organic itself is situated at a place from where you get the most amazing views ever. If you get up a little early, then you can catch a beautiful sunrise from your balcony and see the sky and the mountains being covered in warm hues as the sun starts to rise. You can also see the sky change colors at the evening hour which again makes the mountain view from this hotel extraordinary. It is a quite refreshing change to be served food which is made up organic vegetables that are plucked right before the meals. Yes, you heard me right! 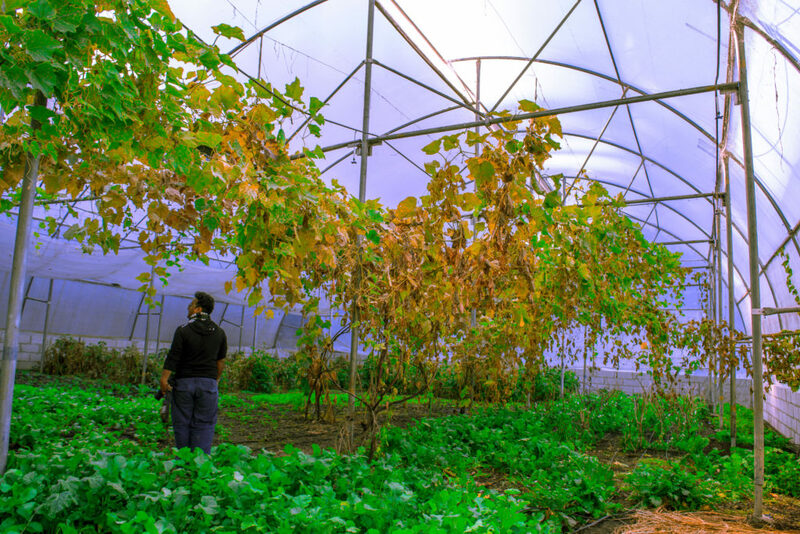 The Pahadi Organic has its own organic farm where they grow a variety of fruits and vegetables. This includes turnips, cabbage, spinach, gourd, and so on. They also grow their own spices and pulses and will also oblige you with a tour if you are interested. If you are someone who gets hungry quickly and often then make sure you inform the staff beforehand. This is because once you order, they go to the farm to pluck the fresh vegetables and then start preparing your meal. So, unless you want to stay hungry longer and wait for your food, make sure you order in advance. The staff at The Pahadi Organic is really sweet and helpful and will make sure that you have the best experience over here. Chetan (owner’s son) makes sure that he interacts with the guests personally and sees to it that they don’t face any problem on their visit here. He is also sweet enough to show you around and takes you to some of the most amazing hiking points. The kitchen staff is quite happy and cheerful too and will answer any question that you might have on the food being prepared and how to prepare it. Overall, you would feel great while interacting with the staff here and won’t feel like you are being ignored or disrespected. Another thing which sets this place apart from other hotels is that they believe in eco-tourism. As a result, they have their own organic farm where they grow most of the vegetables, spices, etc. for their restaurant. But that is not all, they also have a Solar panel installed which provides hot water in your bathrooms and is a great way to conserve energy. Apart from that, they also do rainwater harvesting and often prepare their own fuel in order to be more responsible towards the environment. Finally, the thing which actually sets The Pahadi Organic apart from all the other hotels in the region is their food menu. 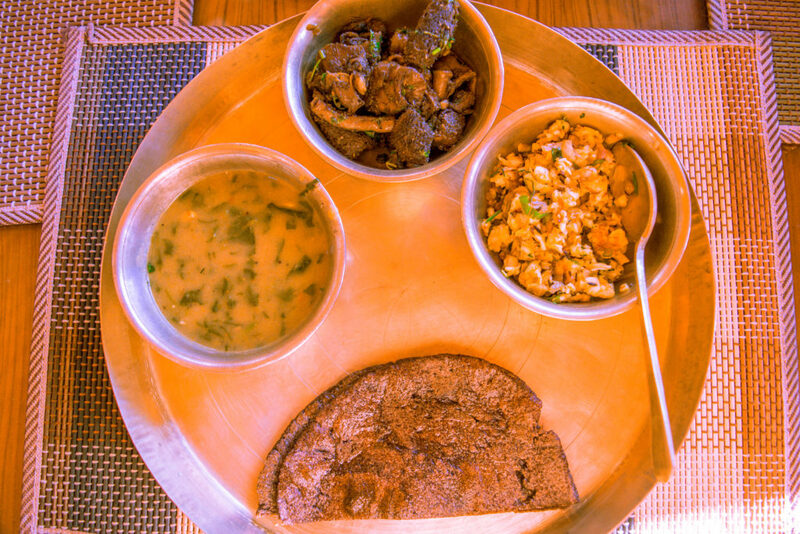 They have a wide range of Kumaon dishes which you won’t find anywhere else and is a great way to deep dive into the Kumaon region. For breakfast, you get Chhou (red rice chapati) along with dahi, aaloo ki sabji, and gaderi ki sabji (arabi) which is oh-so-delicious. I swear, I couldn’t stop myself from having multiple helpings of it! During our entire 3-day stay here, we sampled several local dishes, both vegetarian and non-vegetarian and had a blast expanding our food palate. Here, I tried Bhutuwa (cooked goat intestines), Madue ki Roti (finger millet chapati), Mutton Surua (mutton curry), Gahat ke Dubke (Gahat daal), Palak ka Kaapa (Spinach daal), Red rice, Bater (Quail Curry), and so on. Each dish was unique and exquisite and really opened our taste buds. We also tried the local desserts like Madue ki Badi and Laapsi which were exotic and mouth-watering. Trust me, I can’t stop gushing about the food here and would give anything to go back and taste some more of it! You know what? Once you book your stay here, you don’t have to worry much about exploring and sightseeing. They would suggest the places themselves and will even organize a trip for you to enjoy the gorgeous mountain views. You can go for a walk to the Kholyon Village which is just a 5-minute drive and then a 10-minutes downhill walk from the hotel. As we went during the evening time, we could witness the beautiful Golden hour here and instantly felt like we were in some fairyland. Here, Chetan showed us around the village and introduced us to the locals who were smiling and excited to share their knowledge about the village and the customs there. We also stopped at the Village Head’s house who has the most beautiful and intricately designed homes in the entire village. Another stop that we made was for tea at another villager’s house where we also witnessed the local guava and had some delicious local snacks as well. Here, you can also take a short tour of their local farm and learn more about the process. You will be shown around their 4 polyhouses where they grow a variety of vegetables like turnips, ladyfinger, cauliflower, fenugreek, bottle gourd, onion, and so on. You will also come across a few decorative plants which they use in their restaurant and lobby to decorate the place. And you also get a glimpse of their poultry and animal farm where they keep quail, goats, etc. so that they can prepare them fresh whenever you order. Another thing that you can do here is to request a breakfast at the nearby waterfall which is situated around 20 km from the property. Trust me, this waterfall is a great location to relax in the morning and click some really great photographs at. And since it is not a popular or well-known destination, you can be sure to have it all to yourself. 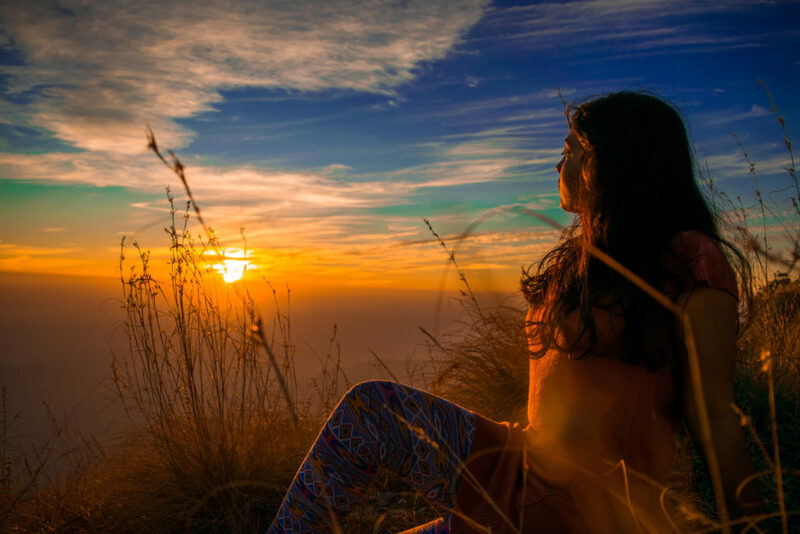 One of my favorite activities while staying at The Pahadi Organic was the sunrise and sunset hikes here. While I am more of a sunset person, this is one of the few places where I actually didn’t mind getting up early (barely) to enjoy the morning views. There are a few places here where you can watch the most amazing sunsets like the Tolyun Dhura, Paragliding site, etc. And if you are lucky then you might witness a gorgeous moonrise and moonset as well. We were extremely lucky because we not only got a chance to observe a mesmerizing and long sunrise and sunset here but an equally magical moonrise and moonset as well. After sunrise, we hiked a little more to the top and could also see some magnificent mountain ranges like the Trishul, Nanda Devi, Panchhuli, and so on. Another great way to keep yourself entertained in The Pahadi Organic is by indulging the adventure activities offered here. They have Ziplining, Paragliding, Paintball, Trampoline, Rapelling, and many more activities here which you can try and lose yourself in. I mean, seriously, you name it and they have it and there are a few things to keep your kids occupied too. So, if you are planning a family trip or just a friends trip, The Pahadi Organic has you completely covered. While we didn’t have time to try each activity here, the ATV ride was quite exhilarating and the trampoline turned out to be quite fun too! Although there is a lot of things to do in The Pahadi Organic itself, that doesn’t mean that you can’t explore the surrounding places here. The best thing about this place is that it is located within driving distance to several other amazing locations like Ranikhet, Almora, Jim Corbett, etc. This is a great way to explore some beautiful Uttarakhand destinations nearby and make the most of your trip to The Pahadi Organic. I am sure that after such a long blog post, I don’t need to emphasize on how much we loved The Pahadi Organic. In the past 3 years, I have easily stayed in more than 50 hostels, homestays, and hotels but The Pahadi Organic can easily be called one of my favorite stays ever. The host, Chetan, was really considerate and helpful during our entire stay and went out of his way to make us feel welcomed. And frankly, I don’t think I am going to forget the beautiful moonrise and sunset here anytime soon. Honestly, it was one of the most gorgeous mountain sunsets that I have ever chanced upon (this includes Bir sunsets as well). Also, the rooms were super cozy and comfortable and I had a really hard time getting out of it. In fact, I had half a mind to skip the sunrise hike (as if I need a reason though) because the bed was so warm and relaxing. But I am glad that I didn’t do that because otherwise, I would have missed out on an epic moonset and morning mountain views. And don’t even get me started on the amazing massaging chair, both Radhika and I had a hard time leaving it. Overall, we truly and sincerely loved our stay here and it has now become a favorite of both Radhika and me. Let us know in the comments if you have stayed here and how was your experience! wonderfully expressed..i was experiencing it through your words..in my bucket list!